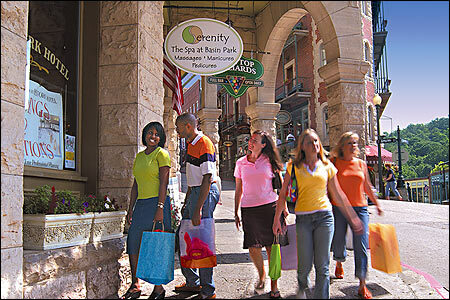 Secluded and peaceful with winding mountainside streets, Eureka Springs has a flair like no other town. In fact, the National Trust for Historic Preservation named Eureka Springs as one of its "Dozen Distinctive Destinations." Streets are lined with Victorian homes hugging cliffsides, and its entire downtown area is on the National Register of Historic Places. Eureka Springs has block after block of one-of-a-kind shops, boutiques, fine art galleries, craft emporiums, spas, museums and restaurants. Festivals and events span everything from blues, jazz and opera to car shows to UFO's, antiques and the arts. Top-name entertainers perform at The Auditorium and thousands attend The Great Passion Play each year. Eureka is also home to several music variety shows. Trolley and carriage rides are a popular way to see the city. Historic hotels and unique bed and breakfast inns, hotels and cabins accommodate visitors. Nestled in the heart of the Ozarks, outdoor opportunities abound. Trout fishing is popular on the White River, and canoeing and fishing are popular on the Kings River. Beaver Lake offers the excitement of water sports, camping, fishing and hiking. The area is also popular for mountain biking and horseback riding. Also, Eureka Springs is 49 miles from the Buffalo National River, and 58 miles from Fayetteville.